Sebastian Ahrens, managing director of Hapag-Lloyd Cruises in Hamburg and a graduate of Cambridge, was in London last week for a presentation of the line’s expedition ships Bremen and Hanseatic at the Royal Geographical Society, as well as a UK press briefing and interviews. The presentation was made by David Fletcher, a member of the Royal Geographical Society, and Trixi Lange-Hitzbleck, both of whom are Hapag-Lloyd expedition leaders. Seatrade Insider meanwhile revealed that Hapag-Lloyd Cruises will go more international with its newest ship, the Europa 2, with announcements in both English and German. 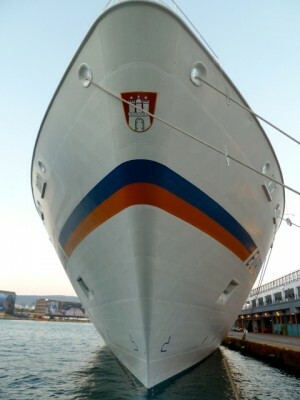 Hapag-Lloyd presently operates the five-star-plus Europa, rated the best cruise ship on Earth (or should we say water?) for eleven years in a row by the Berlitz Guide to Cruising and Cruise Ships, and the top-rated expedition ships Bremen and Hanseatic, as well as the 420-berth Columbus, which will complete her last season in the Great Lakes in 2011. In spring 2012, the Columbus 2, presently operating as the Regatta in the summer cruise trade to Alaska,will replace the present Columbus and in 2013 the line will introduce the Europa 2, which will be built by STX France, formerly Chantiers de l’Atlantique, at St Nazaire. The same yard delivered the Crystal Serenity in 2003 and the Queen Mary 2 in 2004. The fare price inserts for the international market. UK residents are eligible for the Sterling pricing included in the bottom link, while North American residents qualify for the US dollar pricing in the third link. After the perfect wedding day, sail away on the perfect honeymoon. Hapag-Lloyd Cruises’ ms Europa, the only 5-star-plus cruise ship in the world (Berlitz Guide to Cruising & Cruise Ships), is happy to offer their first-ever Honeymoon Packages. The packages include an invitation to the “Restaurant Dieter Mueller,” Europa’s specialty restaurant headed by the award-winning chef of the same name, as well as on board credits. The complimentary Honeymoon Packages apply to newlyweds that begin their honeymoon no later than six months after the nuptials. Honeymooners cruising on shorter itineraries of up to six days, will be welcomed on board with flowers and a large bottle of champagne, a dinner at the “Restaurant Dieter Mueller” including complimentary wines, an invitation to visit the ship’s captain on the bridge during a departure, and on-board credits for beverages and treatments at the Ocean Spa, worth €100 per person. The second package, for honeymoon couples on cruises over one week will include all of the romantic amenities above, as well as an increased on-board credit of €150 per person, a special dinner at the captain’s table, and personal arrangements for romantic dinners for two, giving them the chance to experience the culinary diversity of the Europa.Hapag-Lloyd Cruises is offering the Honeymoon Package for cruises departing within six months of the wedding. To take advantage of this offer, the marriage certificate needs to be submitted before embarking on the cruise. • 7-day cruise with the ms Europafrom Nice via Porquerolles (Iles d’Hyeres), Ajaccio (Corsica), Porto Cervo and Porto Rotondo in Sardinia, Ibiza, Formentera to Barcelona, May 29-June 5, 2011. Cruise-Only-rates start at £2,160 per person. • 11-day cruise with ms Europa from Genoa via Monte Carlo, Barcelona, Valencia, Cartagena, Marbella, Cadiz, Funchal to Lisbon, November 10-21, 2011. Cruise-Only-rates start at £3,110 per person.